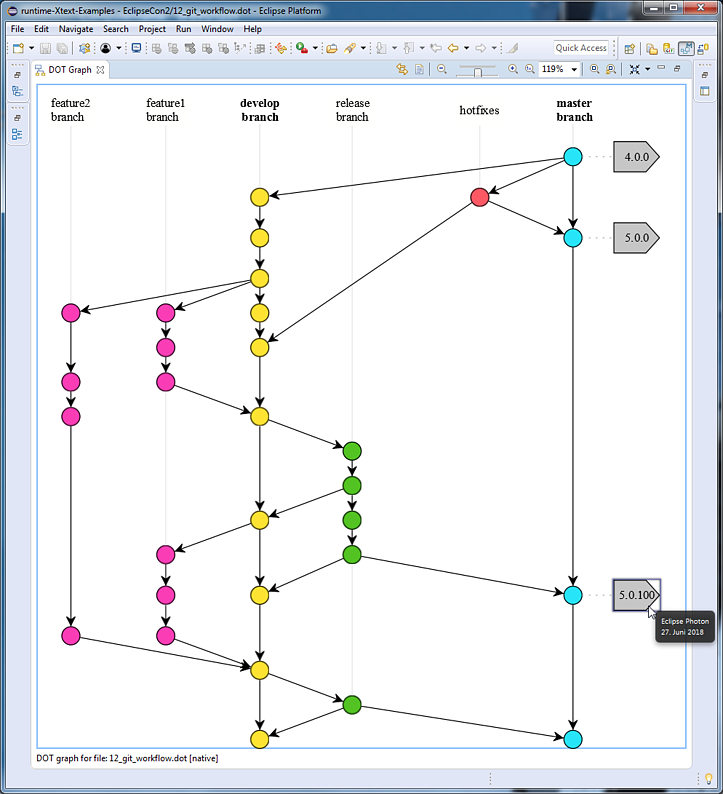 The previous blog post introduced the GEF DOT Editor that assists the user in editing Graphviz *.dot files and the GEF DOT Graph View that is capable of visualizing them in the Eclipse Workbench UI. 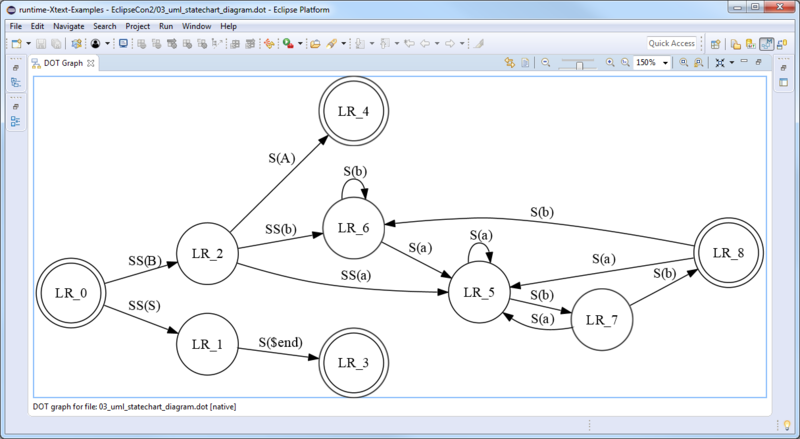 This blog post continues with more complex DOT graphs to show some potential use case scenarios to add GEF DOT-based visualization support to the Eclipse IDE. The finite_state_machine DOT graph definition describes the states (DOT nodes) and the transitions (DOT edges) of a state machine. The initial and final states are visualized by doublecircle node shapes, all other states are represented by nodes with circle shape. Note the usage of the edge label attribute specifying the text labels on the edges. The rankdir=LR graph attribute requests a left-to-right graph drawing in landscape mode. The org.antlr.runtime.tree.DOTTreeGenerator is capable of generating *.dot files from arbitrary ANTLR abstract syntax trees. The following DOT graph definition represents the AST of the 12 * (5-6); 2^3^(4 + 1) expressions. The DOT graph is styled using the bgcolor, color, fillcolor, fontcolor and style DOT attributes. n0 -> n1 // "ROOT" -> "EXPRESSION"
n1 -> n2 // "EXPRESSION" -> "*"
n2 -> n3 // "*" -> "12"
n2 -> n4 // "*" -> "EXPRESSION"
n4 -> n5 // "EXPRESSION" -> "-"
n5 -> n6 // "-" -> "5"
n5 -> n7 // "-" -> "6"
n0 -> n8 // "ROOT" -> "EXPRESSION"
n8 -> n9 // "EXPRESSION" -> "^"
n9 -> n10 // "^" -> "^"
n10 -> n11 // "^" -> "2"
n10 -> n12 // "^" -> "3"
n9 -> n13 // "^" -> "EXPRESSION"
n13 -> n14 // "EXPRESSION" -> "+"
n14 -> n15 // "+" -> "4"
n14 -> n16 // "+" -> "1"
The following DOT graph definition describes the Eclipse Plugin dependencies of the different GEF components. 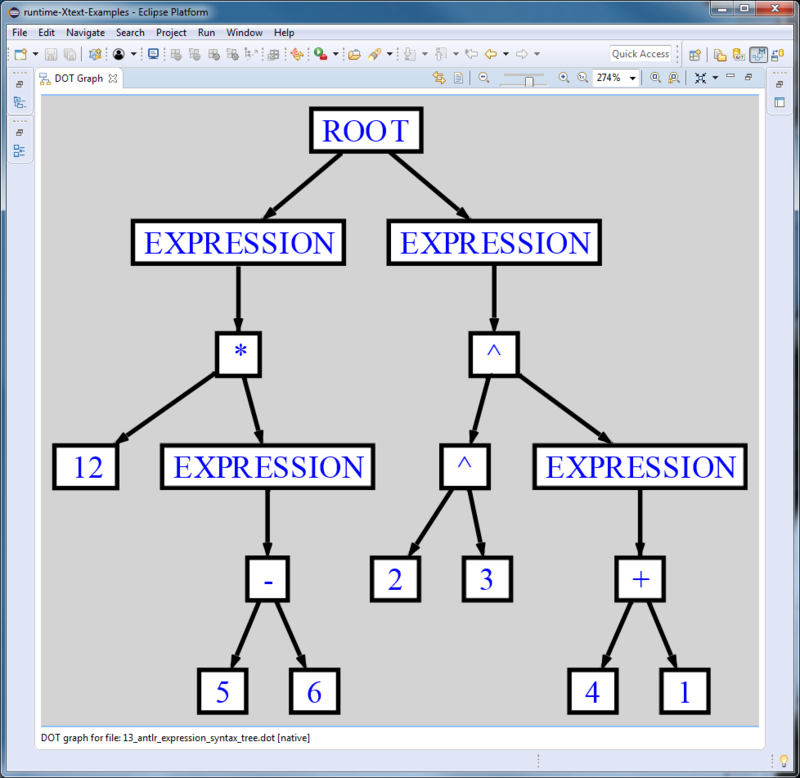 Note how certain nodes are grouped by anonymous subgraphs and the usage of the group and rank attributes to ensure that the nodes are properly aligned both horizontally and vertically. The DOT tooltip attribute can specify additional information that is shown while hovering over a certain node, e.g. the description and the timestamp of a git tag in a branching/merging workflow. All these *.dot files (and also other ones) are hosted on the corresponding GitHub repository. 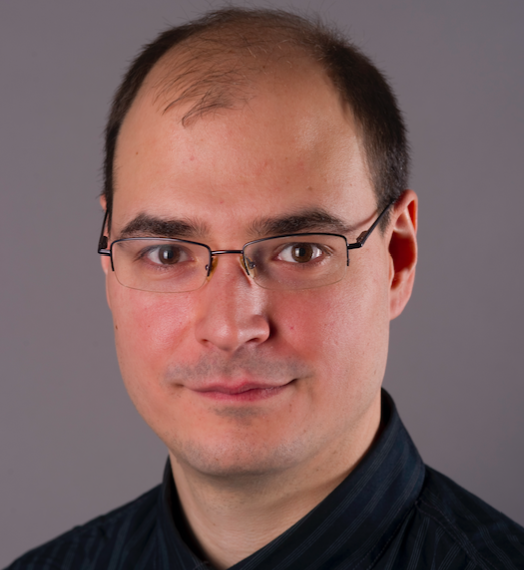 For further information, I suggest you to take a look at the GEF DOT User Guide or visit my GEF DOT session at EclipseCon Europe 2018.